One of the primary functions of the RBI is to control the supply of money in the economy and also ‘the cost of credit.’ Meaning, how much money is available for the industry or the economy and what is the price that the economy has to pay to borrow that money. ‘Availability of money’ is nothing but liquidity and ‘cost of borrowing’ is rate of interest. These two things (supply of money and cost of credit) are closely monitored and controlled by the RBI. The inflation and growth in the economy are primarily impacted by these two factors. 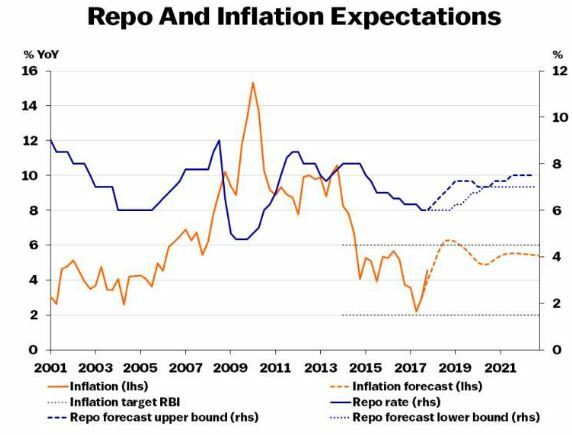 In the recently concluded RBI monetary policy review, the central bank though kept the key policy rates unchanged, have been hawkish in their stance and indirectly signaled a possible rate hike in this fiscal year 2018-19. For the last 2 to 3 years, the interest rates have been on the downward slope and have mostly bottomed out. 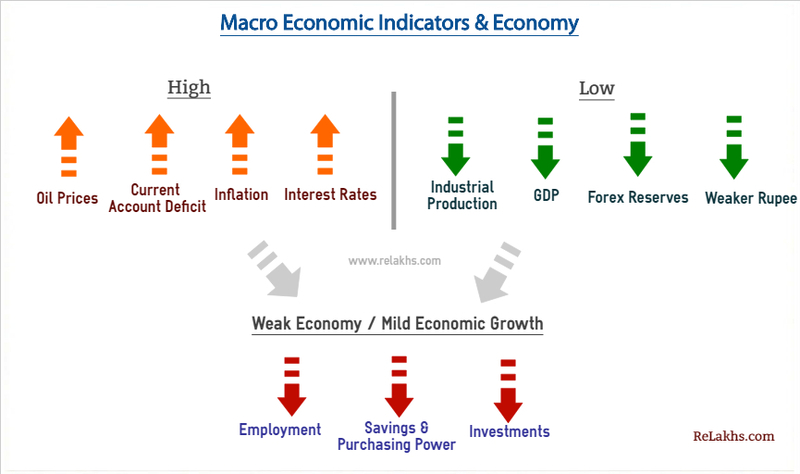 Considering the growing concerns of rising inflation rate, increasing Oil prices, depreciating rupee, global economic factors (like trade-war, commodity prices, US Fed Rate hike) etc., though RBI is maintaining ‘status quo’ for time-being, this may eventually lead to a rate hike sometime in the near future in FY 2018-19. The Banks have already started feeling the heat, with declining deposits and margins. Hence, some of the popular banks like HDFC, SBI, Axis etc., have already started hiking their ‘Lending rates’ (MCLR). Same is the case with Deposit rates. The state run banks like SBI have already revised their deposit rates for various tenors. So, what is the link between the RBI’s key policy rates and Deposit / Lending rates? 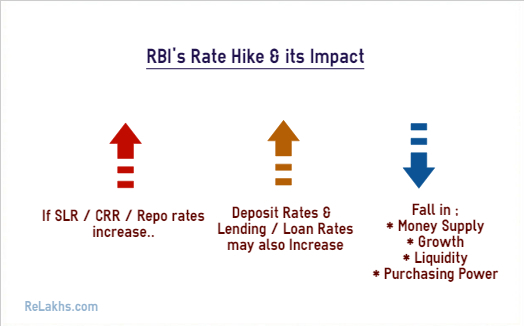 If RBI hikes interest rates, what is the impact on your home loans, fixed deposits, debt mutual funds etc.,? What are the major economic factors that we need to watch out in this Financial year? – Let’s discuss…. Crude Oil Prices : India has benefited from the low oil prices regime for the last two to three years but about 45% rise in crude prices since the middle of 2017 appear to wipe out the advantage we had. The international commodity prices have also been on the rise. Higher oil prices lead to higher import bill for Indian Economy. Inflation Rate : Besides higher oil prices, the central Govt’s push for minimum support price, pay revision for govt employees, good monsoon etc., may lead to higher inflation rate in the near future. Higher inflation leads to lower purchasing power. Current Account Deficit (CAD): Fiscal Deficit and Current Account Deficit (CAD) are referred to as the twin deficits. CAD is the difference between exports and imports by a country. If the value of imports exceeds the value of exports by a country, it leads to CAD. We import Oil from foreign nations. So, high levels of Oil prices can lead to higher CAD in India and vice-versa. Generally, high CAD results in higher interest rates and low CAD results in lower interest rates. An expanding CAD can also lead to high levels of Inflation. 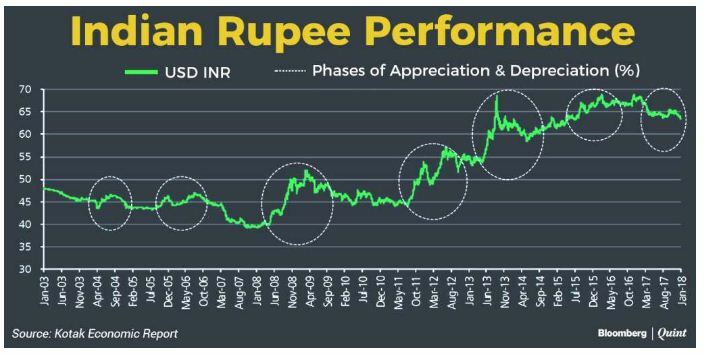 Value of Rupee : Due to the above factors, the value of Rupee against international currencies like US Dollar have been weakening. So, to contain inflation levels, the RBI might hike interest rates. But, this can lead to lower economic growth. Another important factor that we all need to track is ‘prevailing interest rates in the USA’. Any further rate hikes in the US can induce the foreign investors to take out capital from Indian financial markets to US economy. This may not augur well for Indian Equity markets as well. When we need money, we take loans from banks, banks charge certain interest rate on these loans. This is called as cost of credit (the rate at which we borrow the money). Similarly, when banks need money they approach the RBI. The rate at which banks borrow money from the RBI by selling their surplus government securities to the central bank (RBI) is known as “Repo Rate.” Repo rate is short form of Repurchase Rate. So, if the RBI hikes interest rates (like Repo rate) due to the factors discussed above, an increased repo rate leads to higher cost of short-term money. This may induce the bankers to increase their Prime Lending rates (MCLR / Base Rates) and also the Deposit rates (on Savings Accounts, FDs & RDs). Hence, your loan EMIs can become dearer (if banks pass the rate hike to its customers). For Example : If currently a home-buyer is paying an EMI of Rs 42,760 for a loan of Rs 50 lakh with 8.3% interest and tenure of 20 years, then an increase in interest by 0.1% i.e. at 8.4 percent rate, he would be required to pay an EMI of Rs 43,075 i.e. an increase of Rs 315 per month. If you are planning to buy a property through a short-term home loan, you may opt for a ‘fixed rate loan’. An existing home loan borrower could make a partial pre-payment of loan (if you have surplus funds) to reduce the EMI burden after the interest rate goes up. The higher lending rates regime is generally good for ‘property rentals’ market, as fewer individuals apply / qualify for high cost loan(s). A rising interest rate environment is not good for debt mutual funds as well. In this scenario, for short term goals, you may pick Liquid mutual funds. For Medium term goals, advisable to pick Short term Debt Funds or Floating Rate Funds for time-being. When it comes to Gold prices, theoretically, gold and interest rates are inversely related. So, an hike in interest rates may lead to lower purchasing power and thus leading to lower investments in Gold. The investors may re-balance their investment portfolios more in favor of bonds and less in favor of stocks / gold. When interest rates are increased, the general effect is a lessening of the amount of money in circulation, which works to keep inflation low. It also makes borrowing money more expensive, which affects how consumers and businesses spend their money ; this increases expenses for companies, lowering earnings somewhat for those with debt to pay. Finally, it tends to make the stock market a slightly less attractive place to investment. I believe that we are inching towards an interest rate hike. Interest rates have been static for a while now. However, an increase in global rates and domestic consumer price inflation might force the RBI to reconsider its neutral stance and hike interest rates in the near future. Do you also think that the RBI may hike the bank rates in this FY 2018-19? Kindly share your views, cheers! 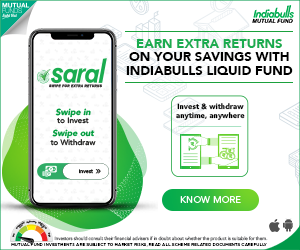 Can you explain why increasing interest rate will effect debt mutual funds? Long-term debt schemes that invest in debt instruments with higher maturity gets badly hit whenever the interest rates go up in the economy. Because of the inverse relationship between yields and prices of bonds, the NAV of these schemes falls whenever the interest rates go up. When the interest rate starts to move up, the price of existing bonds falls which in turn pushes down the net asset value (NAV) of debt funds, translating into lower returns for the investor. As far as debt mutual funds holders are concerned, the impact of rising interest rates is more on the schemes that hold long-term securities compared to those holding bonds which are maturing early. If one has to invest in Debt funds then ultra short term or short term debt fund can be considered. But do not expect fantastic returns. 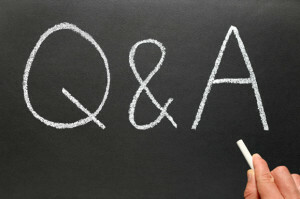 Nice and In-depth article on the Economy & Personal Finances. The sentence ‘an expanding CAD can also lead to low levels of Inflation’, should have been ‘an expanding CAD can also lead to higher levels of Inflation.’ Have corrected the typo error. Thank you for highlighting this! Hope you are able to comprehend this point now?? I am working as full time employee as a fashion designer and also taking work in my part time. I am income from job is more than 10 lakh and part time income is more than 3 lakh total. Which form should I use for return – ITR 2 , ITR 3, or ITR 4 S. Please help not getting any right answer after searching so much. You can file ITR -3. Related article : AY 2018-19 Income Tax Return Filing | Which ITR Form should you file? Appreciate it Sreekanth. One of my part time employer is doing TDS at 10% then do I still need to pay taxes at 30% as my salary from first employer is more than 10 lakh? Can you please tell me. Also, Am I eligible for presumptive tax benefits? Bless you. Thank you. Yes, you need to pay the balance tax. I dont think you may not be eligible for presumptive provisions.